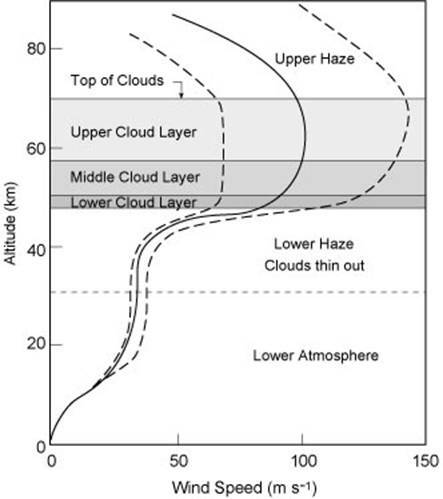 Atmospheric dynamics are dominated by the rapid rotation of the zone centred on the cloud layer, which rotates in 4 Earth days, much faster than the planet, whose rotation period is 243 days. Both rotations are in a retrograde direction. The Venusian cloud layer makes one complete tour of the planet in 4.2 days. This natural convection movement, which occurs from east to west, is called super rotation. The super-rotation motion begins at about 10km, and grows steadily up to 65km, where the equatorial winds reach speeds of about 540km/h. From there on up the wind speed decreases and drops to nothing at about 95km. Therefore Venus’ atmosphere (or at least the cloud layer) probably rotates 50 times faster than the planet itself. This super-rotation has probably influenced the rotation of the planet. In fact, the atmospheric mass of Venus is about a ten-thousandth of the mass of the planet. There must have been an exchange of speed between the planet and the atmosphere to conserve total kinetic energy. So, contrary to what one might think, the temperature at the planet’s surface is almost constant and uniform (on the sunlight side and the night side). This is due to the winds that sweep the planet and allow a uniform spread of the heat. This explains the very weak spread of observed temperatures. So, during a Venusian night of about 58 Earth days, the surface temperature drops very little. This is not true with altitude, where the atmosphere is much thinner. At 100km the temperature varies between +27°C during the day to -143°C at night. It should also be noted that the enormous mass of the atmosphere of Venus also has a large thermal inertia, which largely explains the uniformity of the temperature on the surface of the planet. A bit like the water of the Earth’s oceans. In fact, the mass of Venus’ atmosphere is almost 500 million billion tonnes (5x1020 kg), which is about 100 times that of the Earth, and over a third of the mass of the Earth’s oceans !! At the planet’s surface, however, there is almost no wind, and wind speed never rises above a few km/h. They are nonetheless responsible, together with the corrosive composition of the atmosphere, for an erosion level comparable to that of a river. You must remember that, at the surface of Venus, the atmosphere has a density of about 1/10th of that of water. The winds are stronger at the equator, and slow towards the poles, creating a visible ‘V’ structure on images of the cloud layers. The vertical distribution of the zonal windspeed can be linked to the latitudinal gradient of the temperature by assuming a cyclostrophic equilibrium in the troposphere and mesosphere. Cyclostrophic balance, well verified by observation (fig. 5), is a dynamic state where the horizontal component of the centrifugal force due to rotation is equal and opposite to the force due to the pressure gradient. On Earth, the equilibrium is attained between the pressure gradient and the Coriolis force, and we speak of geostrophic balance.